Ryan Bader’s coach believes his fighter has the formula to defeat Fedor Emelianenko. Bader will be taking on Emelianenko in the finals of the Bellator Heavyweight World Grand Prix. The winner will be rewarded with the Bellator heavyweight championship. It all goes down on Jan. 26 inside The Forum in Inglewood, California. ”It’s going to be a fight between true champions. They are both experienced fighters. Many people talks about Bader being younger and all that, like he’s in his 20’s, but he’s 35. The thing is, he’s an athlete and takes care of himself. They both hit hard and have high-level grappling. It’s going to be a high-level fight and, the longer it takes, the better for Bader because of his conditioning. He does well in five-round fights. Bader got to the finals by knocking out Muhammed “King Mo” Lawal in a matter of seconds, then going on to dominate Matt Mitrione via unanimous decision. As for Fedor, he scored finishes over Frank Mir and Chael Sonnen to reach the finals. 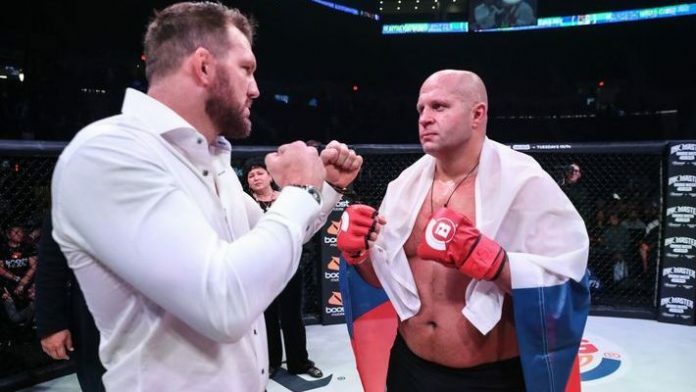 Can Fedor Emelianenko’s sambo, counter the wrestling of Ryan Bader?